Carb Killa Shake by Grenade - Big Brands, Warehouse Prices! If you want to smash hunger and deliver great taste, it may feel like you have few options that are fast and reliable. You’ve done the protein powder bit before. Mix and go. Sure. But is it tasty? If you’re looking for a change of pace, consider the Carb Killa Shake by Grenade. This shake is more like a milkshake it’s so delicious but unlike a milkshake, it won’t add pounds to your waistline. The Carb Killa smoothie is perfect for those on a lower carb diet plan as it’s relatively low in both carbs and fats, while being high in protein. Combat hunger in a hurry – this smoothie will help you push through hunger pains without a problem. Satisfy cravings. With a rich, smooth and creamy taste, you’ll think you’re indulging in something truly decadent. Level up your protein intake: with 24 grams per serving, this shake has it all. 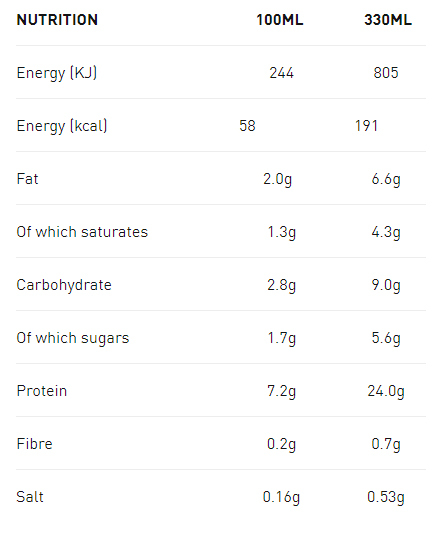 It contains as much, if not more protein than most conventional protein powders. Calorie control. It comes packaged in a ready to drink bottle so you will take in precisely what you need to. There’s no worry about drinking too much and ruining your diet plan. Quick and convenient. There’s no need to worry about mixing this smoothie while you’re on the go. The Carb Killa shake is ready to go when you are. All in all, this is the perfect beverage to take with you to work, school, or just as you go about your day. It can also work great as a post-workout shake if desired if you are currently trying to burn fat and reduce your carbohydrate intake. If you need a meal but are on the go, don’t break you diet. Try Carb Killa Protein Shake instead by Grenade. It’s one drink you’ll come back for time and time again. Carb Killa Shake can be consumed at any time during the day and is best served chilled. Shake well and enjoy as a part of a balanced diet and a healthy lifestyle. Unopened, store at room temperature, once opened store chilled and consume within 12 hours. For best before see neck of bottle. UHT Treated. Ingredients - Water, Skimmed Milk (27%), Protein Blend (Calcium Caseinate (Milk), Whey Protein (Milk)), Cream (Milk) (5%), Maltodextrin, Butter Biscuit (0.5%) (Wheat Flour, Sugar, Butter (Milk), Whey Powder (Milk), Baking Agent: Potassium Carbonate; Salt, Acidifier: Citric Acid), Caramel Sugar Syrup, Stabilisers: Gellan Gum, Carrageenan; Sweeteners: Acesulfame Potassium, Sucralose; Salt, Natural Flavourings.